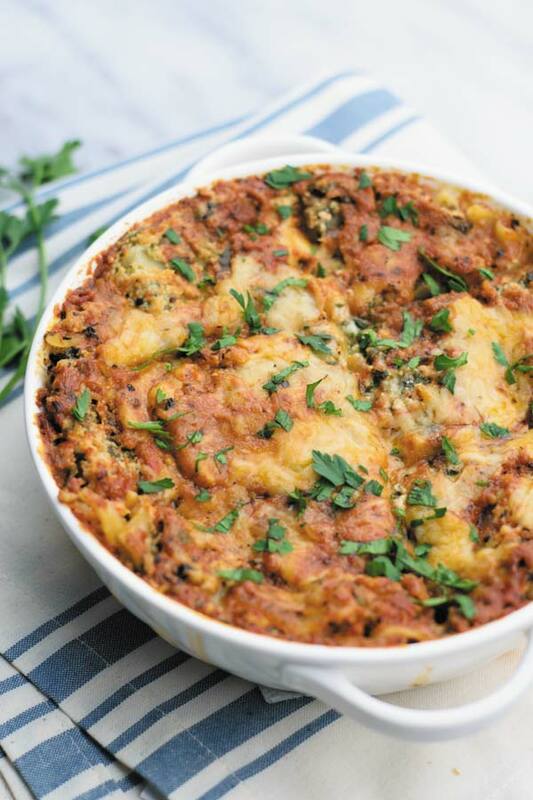 Cheesy vegetarian lasagna packed with spinach ricotta mixture. Super simple but packed with tons of flavor! 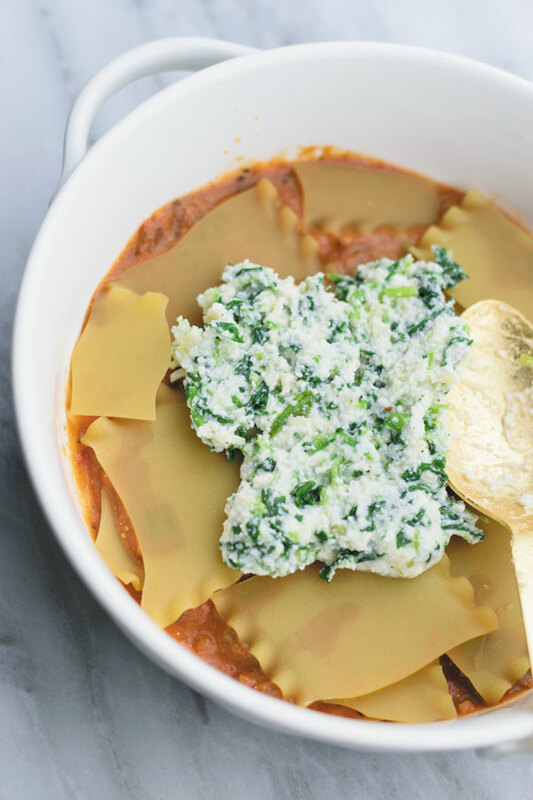 Spicy sauce with veggies, cheesy ricotta mix with spinach, lasagna noodles and more cheese. This sentence makes me immediately hungry even though I just had a hearty breakfast. There’s something about cheese and noodles that makes my mouth water. Lasagnas are our favorite comforting meal and even though I don’t really make them that often, but when I do, I make sure to make a giant pan so we can have leftovers. Because well what is better on a cold rainy day than a cheesy slice of lasagna with some garlic bread?! I started shopping at ALDI a few years ago and since then I have been a regular there. As I mentioned in my previous posts as well, I love shopping at ALDI. Not only do they have amazingly fresh produce, but they also have almost all the basic groceries like fresh meat, bread and dairy products. These days when I compare how much I have been saving just because of shopping at ALDI, it makes me wish I shopped at ALDI earlier! 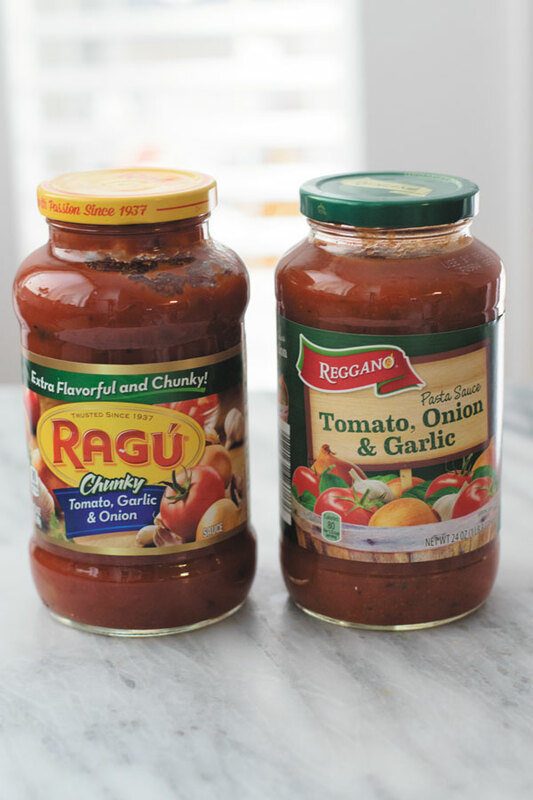 Like the pasta sauces in this case – One is from a famous brand name, same size, same kind and same taste which cost me $2.49 as opposed to the one from ALDI which cost me $1.19. So, when I can buy high quality stuff for cheaper prices, why would I ever shop anywhere else but at ALDI? Same quality shredded parmesan cheese was for $1.99 at ALDI while I paid $4.49 for a national brand. Now that’s so much more money for same quantity and exactly same quality of cheese. If you have been to ALDI, then you must have noticed how ALDI stores are smaller than your typical grocery store – about 17,000 square feet, with around 10,000 square feet of shopping space. And the store has usually just 4-5 aisles which makes shopping so much quicker as everything is within reach rather than running from aisle to aisle in search of the right stuff. 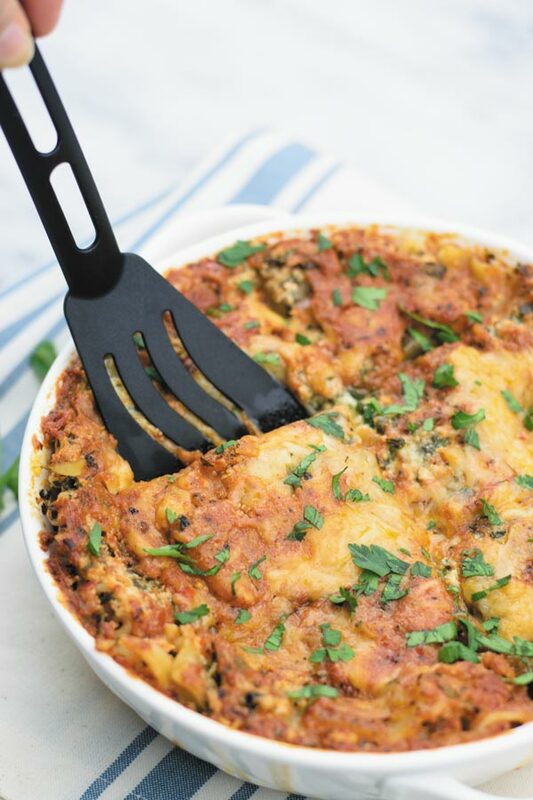 So, this time our favorite Cheesy Spinach Lasagna was made using so many products from ALDI and I must say it wasn’t just delicious but easy on the pocket too, thanks to ALDI. Making this lasagna is seriously simple. If you are one of those souls for whom making homemade lasagna always turns into hours in the kitchen and still it doesn’t turn out good, then you are in for a treat, my friends! 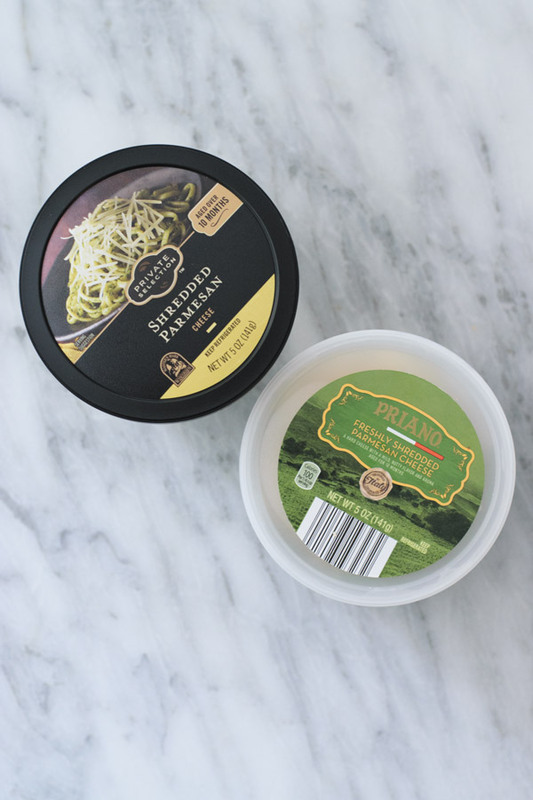 I used no-boil oven ready noodles, so you save time as there is no need to boil noodles prior to assembling. Usually, store bought pasta sauces are already flavorful but I still like to doctor them up quickly by adding some vegetables and lots of spices to make them extra tasty! Trust me, it makes a huge difference. 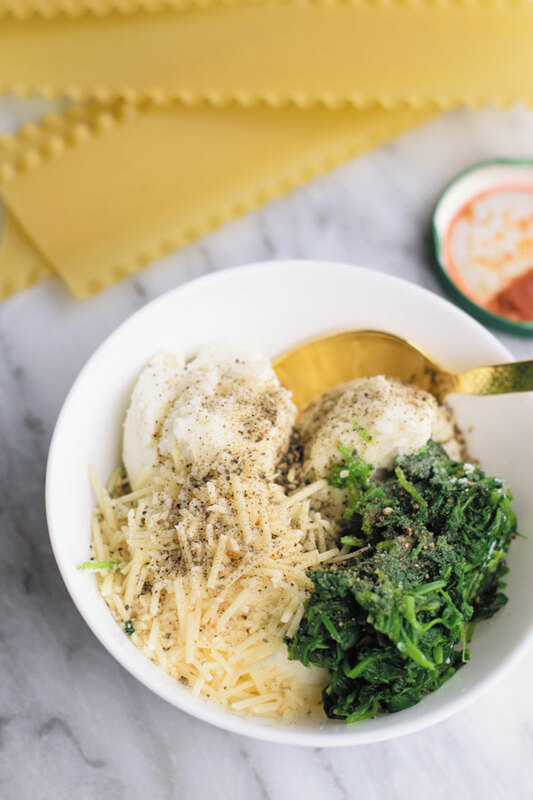 Then, while the sauce is bubbling away, the ricotta is mixed with spinach ( use frozen if you have it, or if using fresh, just blanch it for a minute or two and chop finely), salt, pepper, parmesan and red chili flakes. Then stir it and taste. Now you are all ready to assemble. Start with the sauce first, then the noodles (don’t worry if you have to break them in order to fit in), ricotta mixture, parmesan cheese, sauce, noodles and repeat. Make sure the sauce is not too thick or super thin, but just liquidy enough as noodles will need some liquid to cook. Cover and bake for 45 minutes and then uncover and bake for another 10 minutes. Then broil for a quick 1-2 minutes and that’s it! I like to let it sit for few minutes before serving as by then the cheese and sauce and noodles hold up nicely. Serve with lots of garlic bread and salad. So go ahead and give this a try! If you make this recipe, do tag us by using #naivecookcooks & #ILikeALDI on our social channels. *If you want, you can first saute some finely chopped bell peppers in little oil and then mix the sauce in and continue. *I had lot of leftover sauce which I usually store in airtight container and freeze. **I used a small round dish for making which made enough lasagna for us two hungry souls but if you are doing a bigger dish, just double or triple the recipe as needed. Mix all the sauce ingredients and give it a boil. Keep it aside. Meanwhile mix ricotta with spinach, parmesan, salt and pepper and mix. Taste. In a baking pan, first add sauce and cover it with it. Now lay the noodles to cover all the surface. Now add ⅓ ricotta mix and gently spread it around. Add mozzarella cheese. Add sauce and repeat these layers two more times. Cover the top with good amount of sauce and cheese. If you feel your sauce is on the thicker side, add 2 tbsp water on top of the lasagna. Cover tightly with aluminum foil and bake for 45 minutes. Uncover and bake for another 10 minutes. Broil for a minute or so and let it sit on counter for few minutes before serving. I too love to shop in ALDI!! This looks so very comforting and tempting! Oh, you had me at lasagna! 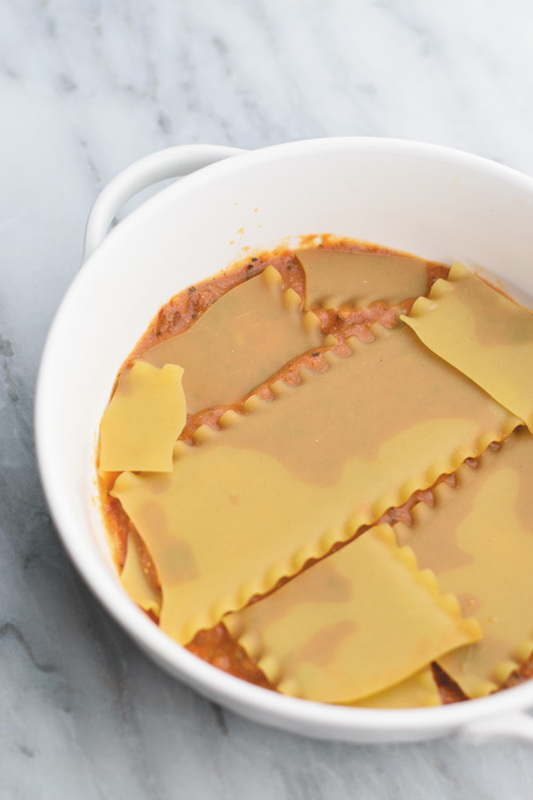 This is the perfect winter comfort food, Ami! 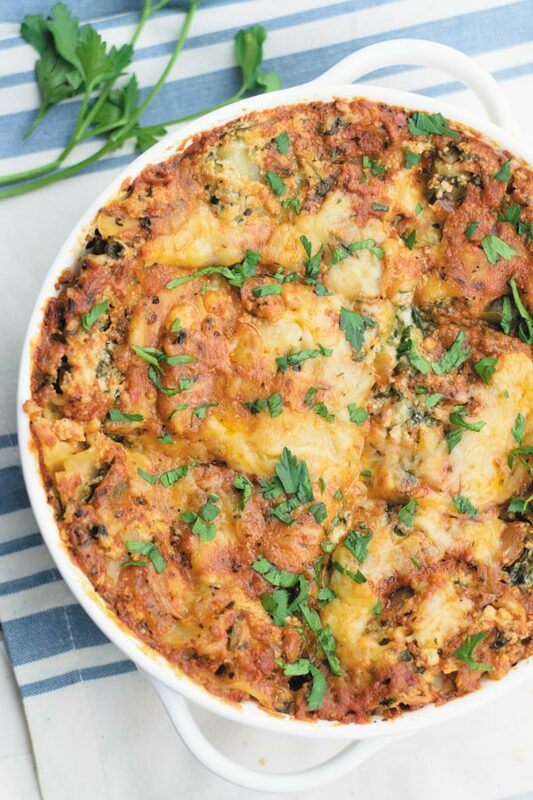 I have a cold this week, and it’s supposed to snow tomorrow…and the thought of this lasagna for dinner tonight makes me really happy! Looks delicious, my friend! Your photos and all that cheese made me immediately hungry too!! Love the spinach in here, because the greens cancel out all the cheese… right?! At least that’s what I tell myself. 😉 This looks super cozy and absolutely delicious, girlfriend! Cheers! We go to aldis every week. We buy lots of things there and save lots of money.